These days, Star Trek: The Next Generation often feels like an old, fuzzy pair of socks: comfortable and well-worn. The first Star Trek spinoff show appears in syndication at all hours, looking a bit washed out and just as dated as the Original Series. It's hard to believe it was viewed as a radical, even sacrilegious, departure 25 years ago. So it's a revelation to watch the restored TNG season one in the new Blu-Ray box set, out today. This show is suddenly fresh, and brand new again. You've probably already heard about the painstaking amount of work that went into restoring the original film negatives, and recompositing all the original visual effects sequences. All of those model shots and then-cutting-edge digital shots are looking completely stunning. But also, everything "pops" — the colors look sharper, the sets look crisper. Tons of details just jump out of the screen. All of those little fixtures on the Enterprise bridge and inside the conference room and other sets look crisp and stark, including those weird little sculptures and a model of the Enterprise-A sitting in the background of the Guest Lounge. Among many, many other random details. And yes, the crazy costumes from the first season also stick out a lot more — not just the unisex outfits that the men wear in the pilot, but also the "cheerleader outfits" the female ensigns wear in the background of many scenes. Unfortunately... it's still season one of Star Trek: The Next Generation. The episodes may look pristine and gorgeous, but there's absolutely no difference in the frequently clunky writing and sometimes wooden performances. This is the season that gives us the "Wesley Crusher condemned to death for stepping on some flowers" episode, the "unfrozen present-day humans blunder into a confrontation with the Romulans" episode, the "logical aliens who think in binary code create the perfect girlfriend for Riker" episode, the "woman-dominated planet" episode, and many other notions that probably sounded great in the writer's room. Oh, and the early "savage Ferengi" episode. And the "Tasha fights a woman in a pink shiny unitard on a jungle gym of deadly stripper poles" episode. The best thing you can say about TNG season one is that it's better than TNG season two, which was hit by the writer's strike. There's nothing as terrible in this season as the "clip show" episode where Riker is forced to experience every emotion to kill a brain parasite. But even with some of the weakest episodes of TNG's first season, there's a certain frisson of excitement at seeing the Enterprise-D crew so young and spiky. And the intense earnestness of these early episodes, which is part of what makes them seem so clunky in retrospect, actually feels sort of charming when they look brand new. At times, it's sort of campily sweet, and then there are moments of actual great acting or real profundity here and there. The episode "Skin of Evil," for example, features some horrendously clunky scenes where Armus taunts Deanna Troi after the death of Tasha Yar — but then Tasha Yar's funeral is actually quite touching. The other reason why the TNG Blu-Ray set is a must-buy for Trek fans (and for anybody who's obsessed with classic television) is the insane amount of detail on the two new featurettes. In addition to some featurettes brought over from previous DVD releases, there are a couple of new features that are just jaw-dropping. First of all, there's a documentary about the whole remastering process, in which you come to grips with the enormity of the challenge the production company faced in upgrading these episodes. There are a few moments of an early experiment with doing an "upconversion" of the old SD masters — and it looks just awful. And then you learn how Mike and Denise Okuda, and an army of craftspeople went into the mine in Pennsylvania where thousands and thousands of cartons of film stock and sound elements were stored, and set about restoring it all. This box set represents a staggering technical achievement, and it's really amazing to come to grips with it. The other featurette is even more fascinating — "STARDATE REVISITED: The Making of Star Trek: The Next Generation" looks at the origins of the series, from the first announcement of its conception. There are tons and tons of wardrobe tests, makeup tests, and prop tests — and even camera tests for the carpets leading into the Enterprise bridge. You learn just how hard it was to create the wishbone-shaped rail in the bridge. You find out how someone's hair clip became Geordi's visor, and how close Data came to being colored bubblegum pink. There are so many insane discoveries in that featurette — including the fact that the people you can glimpse moving around in the Enterprise conference room in the TNG opening credits are actually a super-crude hand-drawn animation. Plus there's a lot of stuff about how close we came to having different actors play Picard and Riker — and the original first choice for Picard makes it clear, in an interview, just how wrong he would have been for the role. And the other thing that makes the making-of featurette such addictive viewing is the little bits of honesty about just how much turmoil was going on behind the scenes in that first season. 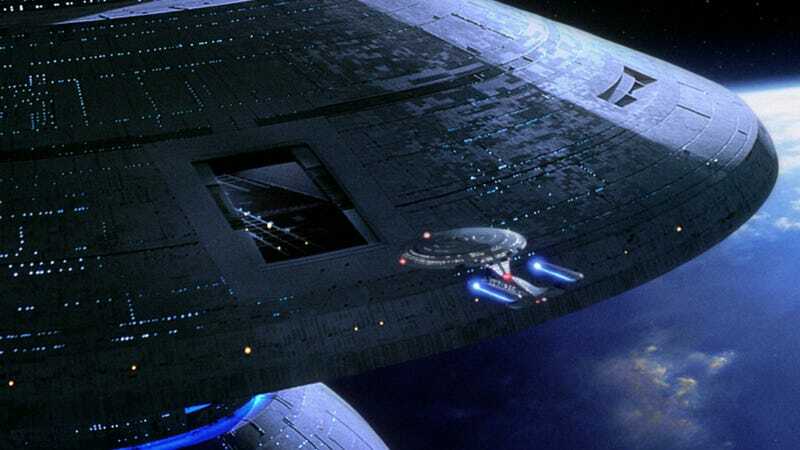 The writer's room had huge turnover, as veterans of the original Star Trek (including D.C. Fontana and David Gerrold) departed early on, and Gene Roddenberry tried to maintain an iron grip on the scripts despite his declining health. There's some pretty candid talk about the fact that Roddenberry wanted to avoid having much conflict in the storylines, which is antithetical to real drama. Star Trek: The Next Generation was a daring reinvention of a universe that was already well established at that point. And now, thanks to the remastered episodes as well as some revealing featurettes, you can rediscover just what a strange new world it was.